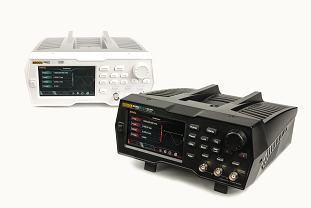 RIGOL Announces Two New Series of Arbitrary Function Generators. Beaverton, OR - September 12, 2018 - RIGOL Technologies introduces the DG800 and DG900 Series of Arbitrary Function Generators. All models come standard with 16Bit Resolution, an intuitive touch display, a silent fan-less design and new advanced signal generation capabilities. These innovations provide RIGOL customers with unmatched signal generation performance at an unprecedented price point. The DG800 Series is perfect for Educators, Hobbyists, and Engineers needing signal generation from 10-35MHz. With a starting price of just $279 the DG800 represents the most affordable 16Bit Generator on the market. But beyond 16Bit Resolution the DG800 delivers advanced capabilities never before seen in a basic generator. The DG800 allows users to combine cycles of different waveform types to generate complex test sequences. The DG800 allows the user to generate complex dual tone and harmonic signals useful for filter, noise, and RF Testing. In addition, integrated PBRS and RS232 generation make testing control and communications links easier than ever before. The DG900 Series delivers all of the same powerful capabilities as the DG800 but with frequency ranges from 50MHz up to 100MHz. Starting at just $599 the DG900 is the perfect tool for Embedded, and IoT engineers needing a performance generator. The DG900 delivers significantly higher performance and capabilities at a dramatically lower cost than the Tektronix AFG3000 and other competitive options. "RIGOL is very proud of our tradition of delivering low cost/high capability generators. Our legacy products have established RIGOL as a leader in low cost signal generation. The DG800 and DG900 continue that 20 year legacy of innovation and deliver amazing value to our customers," says Michael Rizzo, General Manager of RIGOL North America. "Priced from $279 to $999 these new generators provide unmatched capabilities and signal fidelity which will delight both the engineers and the accountants." The DG800 and DG900 are available and shipping now. The DG800 has 6 Models (10MHz w/1ch or 2ch, 25MHz w/1ch or 2ch, and 35MHz w/1ch or 2ch) starting at $279. The DG900 has 3models (50MHz, 70MHz, or 100MHz) all with two output channels starting at $599. RIGOL Technologies is transforming the Test and Measurement Industry. Our premium line of products includes Digital and Mixed Signal Oscilloscopes, Spectrum Analyzers, Function/Arbitrary Waveform Generators, Programmable Power Supplies and Loads, Digital Multimeters, Data Acquisition Systems, and application software. ?Our test solutions combine uncompromised product performance, quality, and advanced product features; all delivered at extremely attractive price points. This combination provides our customers with unprecedented value for their investment, reduces their overall cost oftest, and helps speed time to completion of their designs or projects. ?